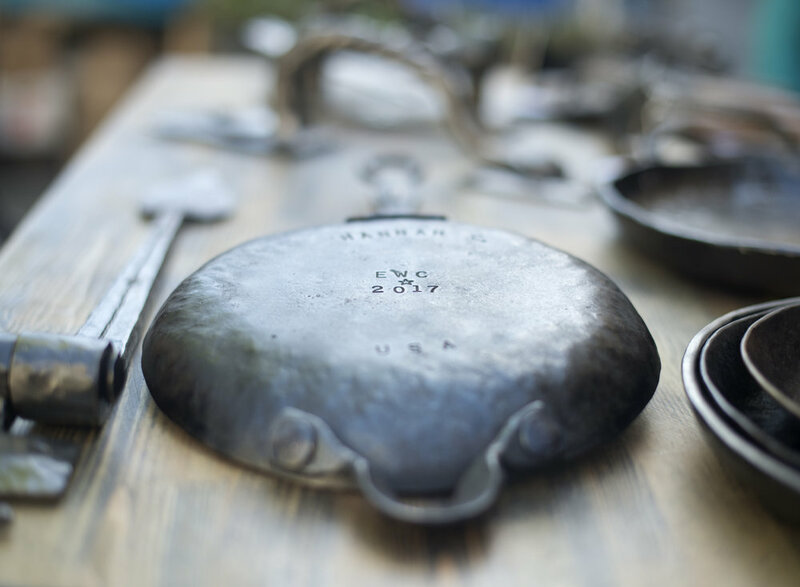 We met some great folks at a show in Charlottesville this weekend, and I enjoyed sharing the story behind our skillets. Friends who know me know that I can talk all day about my work at Heart and Spade, and I did just that at this show, losing my voice in the process. Lots of folks were interested in learning more, so I figured I’d put pen to paper in the meantime. My skillets are perfect for sautéing veggies, frying eggs over easy, searing a steak, simmering a delicious sauce, and even baking a cobbler or cornbread for thanksgiving dinner. They are forged carbon steel, not cast iron. No less than 25,000 hammer blows were driven into the steel to create the skillet. (Yes, I counted.) The difference between unadventurous cast iron and avant-garde carbon steel is in the cooking surface. My skillets are smoother and not porous like cast iron, making them quick to season, and a dream to use and clean. You have not known nonstick until you see an egg skate around the skillet like a hockey puck. Lighter than cast iron, my skillets are friendlier to use, and more responsive to heat while distributing it evenly across your Saturday morning pancakes. Flimsy store-bought pans, on the other hand, will warp and heat unevenly. Made one at a time with a meticulous attention to detail, the skillets are crafted over a 10-hour period. Your family will be able to use the skillet on some Thanksgiving dinner many generations from now, and you get to use it till they are ready. These skillets are built to last; consider it an investment in a family heirloom. Did I mention if you ask nicely, I’ll put your name on it? The engraving process takes time, but when someone asks for “Love Mom” or a wedding date, I love to put that permanent timestamp on the piece. Want to learn more? Check out our shop online, follow Heart and Spade Forge on Facebook and Instagram, and reach out to me. I’m happy to talk your ear off. This November our lines of hand forged cookware and garden tools were awarded the Made in Virginia Gear category winner by Virginia Living magazine. When I came up with the idea to begin crafting skillets, I had no idea they would resonate with so many cooks and chefs. To be honest, I was hesitant to veer away from the tried and true cast iron. Every family has one and it seems as American as apple pie and baseball. Truth be told, cast iron does not forge. It is like hammering hot concrete. Carbon steel is malleable, good for blacksmiths and shoes. A craftsman does not simply stop being a craftsman when he or she leaves the workshop, so naturally I brought this same mentality to other aspects of my life. I am the cook of the household, and I loved the durability and tradition of cast iron cooking, but disliked the heft of the design and the labor involved in cleaning even a seasoned pan. I knew carbon steel’s surface would be much finer than cast iron’s; therefore, it would season much faster and be lighter. Later, I came to find a majority of commercial kitchens primarily use carbon steel for exactly those reasons. The carbon steel skillets are incredibly popular in Europe as well. Being a blacksmith, I had to try my hand at crafting my own. 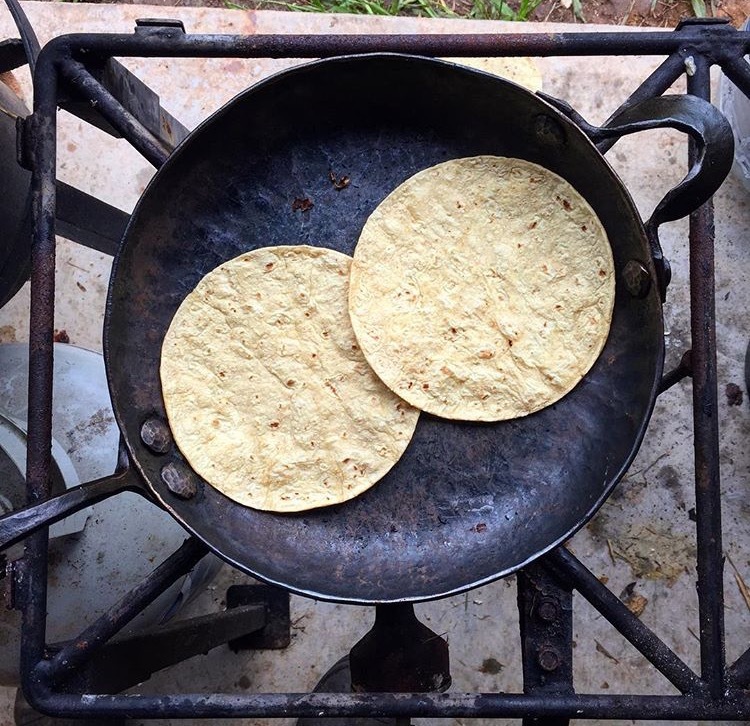 The first time I cooked on one, I remember feeling like the prospector who stumbled on El Derado. Not only was it nonstick, but it was also incredibly responsive to the heat. I am no chef, but these are a dream to use. The garden tools were just an extension of that same mentality. I wanted to create an implement with the same passion that gardeners use to cultivate their crops. My mother used to get me to repair her broken garden trowels that were poorly designed with little integrity. Metal will move where you want it to go if you know how to work it. The thought of a riveted or welded construction crossed my mind as it would result in a cheaper design, but that goes against my design philosophy. I knew the best tools would be forged from a single piece of steel, whereas no weak points would occur. Every aspect of the tools is deliberate, from every hammer blow to the hardwood handles. My tools are built to last generations. To be mentioned in Virginia Living is an honor. Our state is filled with a multitude of superb craftsmen and craftswomen. Past winners of this award are amazing companies that create beautiful work. I am humbled by this opportunity and to be a part of this great community of artisans and creators and look forward to what the future holds. I am excited to announce that Heart and Spade Forge, LLC has officially opened its doors in Roanoke, Virginia. Over the last month, I have been moving my shop piece by piece from Waynesboro to Roanoke. Keep in mind, blacksmithing equipment isn’t the lightest thing in the world. I’m finally starting to get settled and working overtime to meet with builders, contractors, architects and other clients to create my work log. Even though I just moved in, I’ve also really been enjoying meeting other local business owners and craftsmen, getting the pulse on the area and local scene. I’m not new to Roanoke, though. After attending Roanoke College and meeting my now-fiancé there, we’re excited to be back in the city together. As much as we loved Roanoke, we didn’t choose the city just for our alma mater. Roanoke has a rich industrial history that it doesn’t polish over. At the same time, it’s a city that holds a lot of potential with a budding economy. It’s this perfect storm of embracing industrial roots and fostering small businesses and innovation that brought us here. Our new shop also places us at a central point on the East Coast, an optimal location for meeting and working with a variety of clients. This has been a move more than 10 years in the making. I always joke that I was a closeted blacksmith all this time. Working with metal has always been my passion, and I’ve had the privilege of crafting many custom creations that I am truly proud of. Working in this field part time, however, was wearing on me. I am obsessed with moving metal, and confining that passion into just four or five hours after a separate fulltime job was not cutting it anymore. With the support of my fiancé, I’m making the leap. This is my dream. I live and breathe to forge custom pieces, and this new shop not only offers the company room to grow physically, but it also allows for personal and creative growth. I cannot wait to see what challenges Roanoke brings my way. Be sure to follow us on Facebook and Instagram to stay up to date on our move and projects in the new space. We’d love you to come out the shop as well. Shoot us a message or give us a call! First night with keys to the shop. First desk moved in before bookcases installed. Bringing in some of the bigger toys. Electrician helping us getting settled with new overheads. Going public: It can be done. 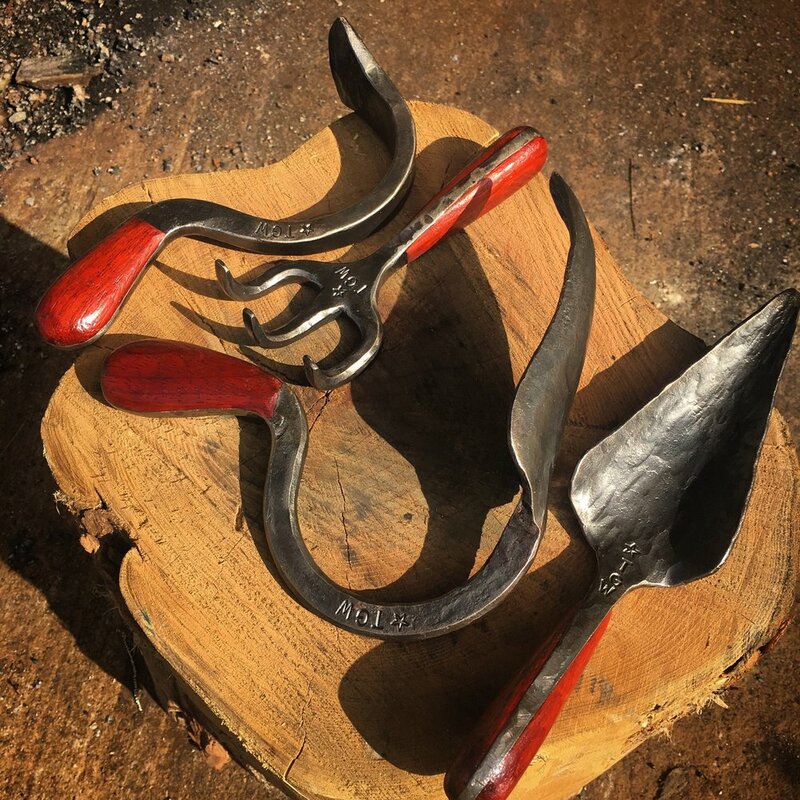 A lot of people are surprised that there are still blacksmiths out there- let alone blacksmiths who don’t make a career out of shoeing horses or making knives and swords. There are always a lot of questions that I get asked, the basics. When did you start? Where's the shop? One question that always peaks my interest, though, is “why?” Why do I forge? Moreover, why bother trying to make a living off of it? Simple enough question, but the answer is deeper than just making money. I went public to bring in a larger variety of projects, challenges and opportunities into my shop. I could have chosen (and was advised by many) to get a big-wig chemistry job, keeping blacksmithing as a side hobby. While it’s an option worth considering, it’s not one that I can take seriously. Everything I do revolves around my fixation of manipulating metal. If I watch TV, I look at the sets and the furniture, redesigning it in my head to decide how I would build it. If I look at a tree, I look at the patterns and lines of the branches and imagine how I could incorporate them into a gate or railing design. I could continue to remake and improve my own ideas until I am blue in the face, but I would be stuck in the rut of my own perspective. What I love about opening my shop to the public is having people come to me with the strangest requests or ideas. This gives me the opportunity to brainstorm - to customize - in ways that I wouldn’t think to do otherwise. I have to figure out how to stretch the metal to make the product that matches the client’s vision. I would never encounter many of these ideas and problems to solve if I did not put myself out there and let people know what I can do for them. This urge to create runs in my family. My father has motors. My grandfather has electricity and radio. My namesake from 100 years ago had an entire printing operation set up in the family barn. His business card simply stated, “It can be done.” I like to believe I’m carrying on that motto with Heart and Spade. If you will it, we can create it. WAYNESBORO, Va. (Oct. 2, 2015) - Heart and Spade Forge was accepted as part of the juried 2015 Fall Foliage Festival's New Artist Show. On Oct. 10 and 11, the forge will set up camp in downtown Waynesboro and share the streets with select artists from all over the region (10 a.m. to 5 p.m. Saturday, noon to 5 p.m. Sunday). Pieces for sale will include newly designed fireplace sets, textured bowls, jigsaw bottle openers, stools and hooks. If you're in the area, we'd love to see you swing by our display!